With back-to-back losses and a heavy schedule the rest of January, the Toronto Maple Leafs must be asking themselves a lot of questions. Q: Coach Randy Carlyle keeps insisting his goalies are 1A and 1B, so when are they going to stop playing like 2A and 2B? A: There has been much pressure on Jonathan Bernier and James Reimer this season, especially with the Maple Leafs constantly being outshot. For the most part, the tandem has come through with flying colours. However, with a playoff spot now in jeopardy, the goaltending has fallen off. 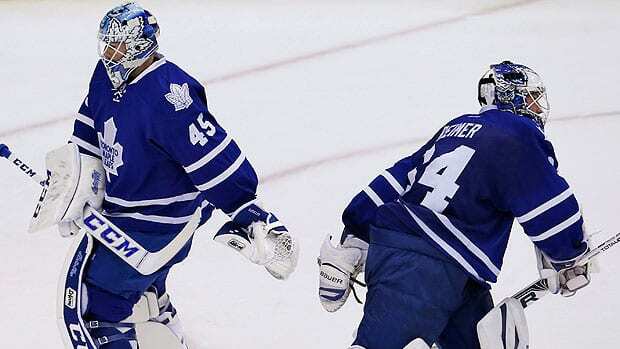 Reimer was pulled a couple of times and Bernier, given the opportunity to be the team's No. 1 goalie with six straight starts, has lost some of his early-season magic. Q: Can defenceman Dion Phaneuf rediscover his offence? A: Phaneuf has done a superb job this season shutting down the opposition's top scorers, but for the Maple Leafs to be successful, they need more than that from him. Phaneuf has just four goals and 17 points despite playing the point on the first power play unit. He has just six power play points in 42 games. Might be time to drop him to the second unit and give Morgan Rielly or Jake Gardiner a shot on the top unit with Cody Franson. Q: Do the Maple Leafs need to dress tough guys Colton Orr and Frazer McLaren together so often? A: There will be nights when both heavyweights are required. However, there are also nights when more skill is needed and the two fighters just sit on the bench for most of the game. Most teams play four lines nowadays and with the Maple Leafs are playing six games in nine days, as they are in the midst of doing now, being unable to play the fourth line wears down the top three lines. Against the Islanders Tuesday Orr played six minutes 27 seconds, McLaren 5:19 and Holland, who is skilled, just 4:30. Q: Is coach Randy Carlyle too stuck in his ways? A: This is a tough one because what he is asking the players to do, play more aggressively and control the puck better, leads to winning hockey. The problem is, he may not have the right personnel to play the game he wants. That is not to say this group couldn't make a better effort to play more like Carlyle has been asking them to play Also, when the team is in need of goals, as it was in the third period against the Islanders, why keep throwing one-goal scorer Jay McClement over the boards when a guy like Holland (five goals in 22 games playing on various lines, often with plumbers) is available? (Call that bonus question). Editor's note: Holland was sent to the American Hockey League's Toronto Marlies on Wednesday with fellow forward Carter Ashton recalled. Q: When will David Clarkson start being David Clarkson? A: It had better be soon. After a horrible start to his season, which included being suspended for the first 10 games, Clarkson has not come close to looking like the productive power forward he was with the New Jersey Devils. By simplifying his game, which he had done prior to hurting his foot and missing most of the past two games, he stands a better chance of enjoying success. In any case, three goals and eight points in 31 games is not cutting it. Q: Has streakiness crept back into Phil Kessel's game? A: It would appear so. While the exciting right-winger has 20 goals and 38 points in 44 games, Kessel has scored in just two of Toronto past 10 games and three of the past 14. Kessel signed an eight-year, $64 million US contract extension with the Maple Leafs Oct. 7. Q: Why has Nazem Kadri taken a step backwards? A: The likeable centre finally looked comfortable as a full-time NHLer last season when he finished second in team scoring with 18 goals and 44 points in 48 games. He was plus-15. This season he has not looked nearly as authoritative and when he was given a shot to play on the top line with Tyler Bozak injured, he did not take advantage of the situation. Kadri has 11 goals and 25 points in 40 games and is minus-11. Q: Is there too much yelling going on? A: Heaven knows with the way the Maple Leafs have been playing lately, it gets under the skin of the coaches. But dealing with that anger by constantly yelling becomes repetitive and ultimately the players tune it out. If the rink is not a fun placed to be for the players, the coaching staff stands little chance of getting its message across. Q: Is it a case of what you see is what you get? A: No. To be fair to everyone involved, the Maple Leafs have not iced a complete lineup in a single game this season. It started with Clarkson's suspension and was further complicated by centre David Bolland suffering a severed tendon. Other have missed games because of injury and suspension along the way. General manager Dave Nonis has done a nice job acquiring help in the form of Holland and defenceman Tim Gleason. He may be required to do more via trades. Q: What will happen if the Maple Leafs slip out of a playoff position before the Olympic break? A: That is the most important question because president and CEO Tim Leiweke has made it clear it is his intention to build a championship team and missing the playoff a year after making it for the first time in eight seasons is not likely to sit well with the new boss.